FILE - Kim Yong Nam, head of the Presidium of the Supreme People's Assembly of North Korea, at the Mansudae Assembly Hall in Pyongyang, North Korea, Oct. 4, 2013. North Korea's ceremonial head of state will lead a high-level Pyongyang delegation to the Winter Olympics in South Korea later this week, officials in Seoul said Sunday. Kim Yong Nam, the head of the North Korean parliament, is being accompanied by three other officials and 18 support staff, the South Korean unification ministry said. The delegation plans to arrive Friday for a three-day visit at the start of the Pyeongchang Olympics. 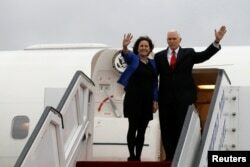 FILE - U.S. Vice President Mike Pence and his wife, Karen, wave as they prepare to depart Ben Gurion International Airport, near Tel Aviv, Israel, Jan. 23, 2018. The Pences leave Monday for a trip to Northeast Asia, including a stop at the Pyeongchang Games. The United States will be represented at the opening of the Olympic Games by Vice President Mike Pence, who arrives in Seoul on Thursday and will dine that evening with South Korean President Moon Jae-in. 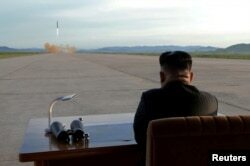 The North Korean visit reflects a possible easing of tensions between the two Koreas, after months of U.S., South Korean and Japanese verbal attacks on North Korea for its internationally condemned ballistic missile and nuclear weapons tests. The two Koreas are still officially at war after the Korean conflict in the early 1950s ended with an armistice but not a peace treaty. Aides to Pence told reporters last week that the American vice president will work in Seoul to oppose any relaxation of the international pressure on North Korea, which is believed to be just months away from being able to strike the United States with a nuclear-armed missile. Pence has “grave concerns” that North Korean leader Kim Jong Un “will hijack the messaging around the Olympics. The North Koreans have been master manipulators in the past. It’s a murderous state," one U.S. official said. The official emblem of the 2018 Pyeongchang Olympic Winter Games is seen in downtown Seoul, South Korea, Jan. 18, 2018. Signs of easing tensions between the two Koreans include plans for their athletes to march to together at the Olympics opening ceremony Friday and to compete together on a unified women's hockey team, their first in 27 years. North Korea is sending 22 athletes to the Games. The path for the North Korean visit opened on New Year's Day, when North Korean leader Kim Jong Un signaled his willingness to let Pyongyang's athletes participate in what South Korea is calling the "peace Olympics." That led to a series of high-level meetings between the two countries.